Primero muchos preguntarán: Qué es el Camino Real? 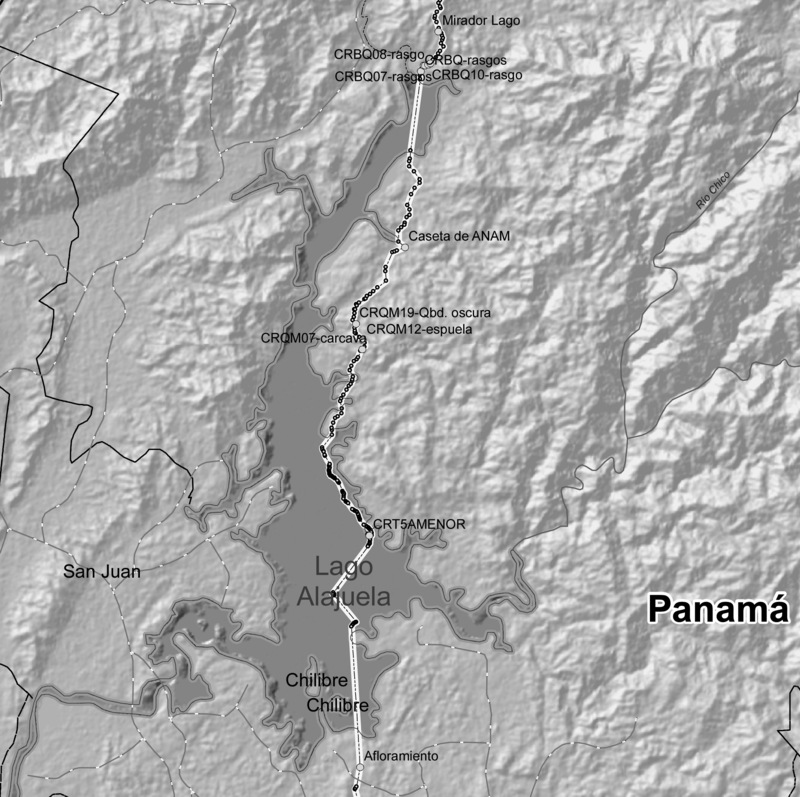 Este no sólo es el Camino por donde paso todo el oro y plata por Panamá, sino también la ruta que formó la sociedad, historia y la economía de Panamá entre 1519 y el final de la colonia. 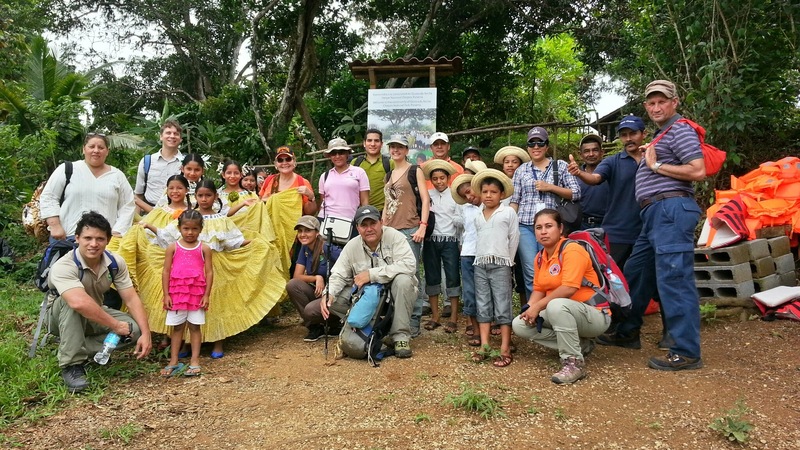 El crisol de razas que todos estamos orgullosos de pertenecer en Panamá nace de el y el origen de la ruta entre los océanos, a decir el Camino Real es el abuelo del Canal de Panamá. Se imaginaba/sabía eso? En el 2011 comenzamos con visitas al Camino Real cerca de la comunidad, para eso limpiaron tres kilómetros de la ruta para poder caminar nuevamente por el antiguo camino. 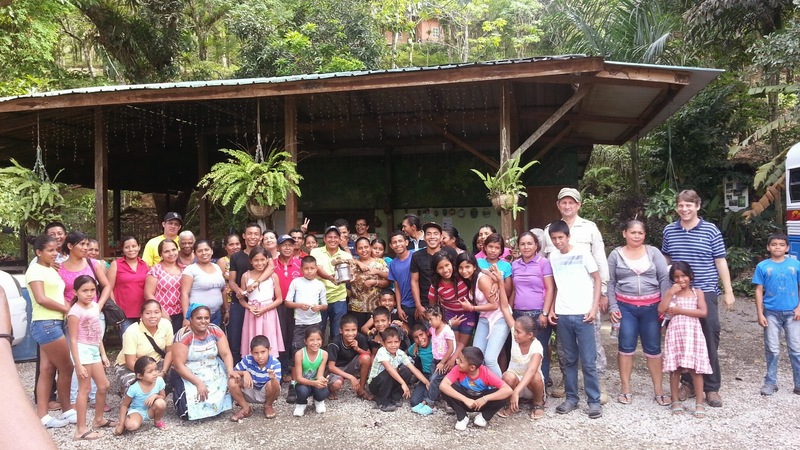 La comunidad de Quebrada Ancha trabaja desde 2008 en el rescate del Camino Real, aquí en una reciente visita con el proyecto ECOTUR-AP. Tan importante que sea el impacto para el desarrollo sostenible de las comunidades Quebrada Ancha y Santa Librada y la conservación de los parques nacionales, más debemos destacar su aporte para recuperar la memoria histórica del antiguo Camino Real y el patrimonio de todo el pueblo panameño. En las fiestas patrias nos recordaremos que estas dos comunidades están haciendo patria! P.D. : Y si quieres saber más y apoyar el trabajo de recuperar la historia, inscríbete en la lista para recibir información de las visitas a las comunidades del Camino Real! 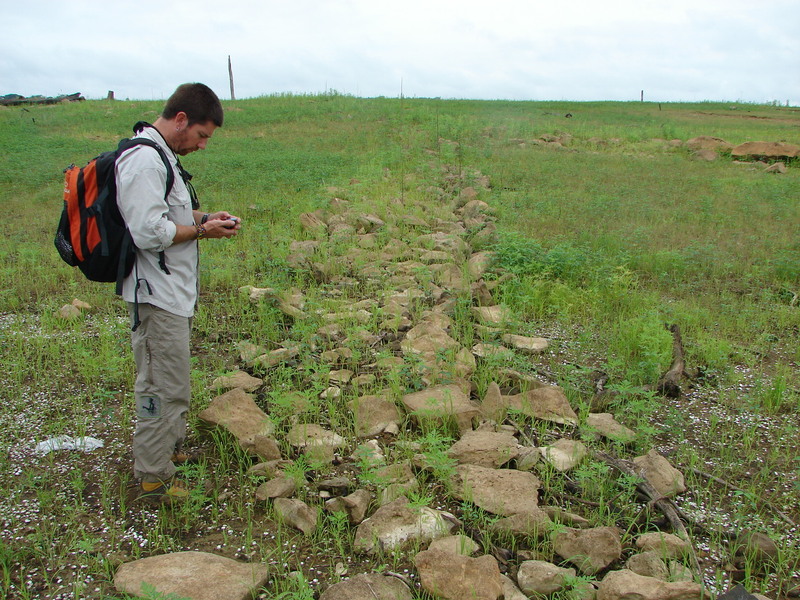 Volume 9, number 2 of the Journal of Latin American Geography published an article on the Camino Real research project. Unfortunately a video link was not printed correctly in the article. To get a copy of the journal please contact JLAG at http://www.utexas.edu/utpress/journals/jlag.html or leave a post here and we will put you in contact. 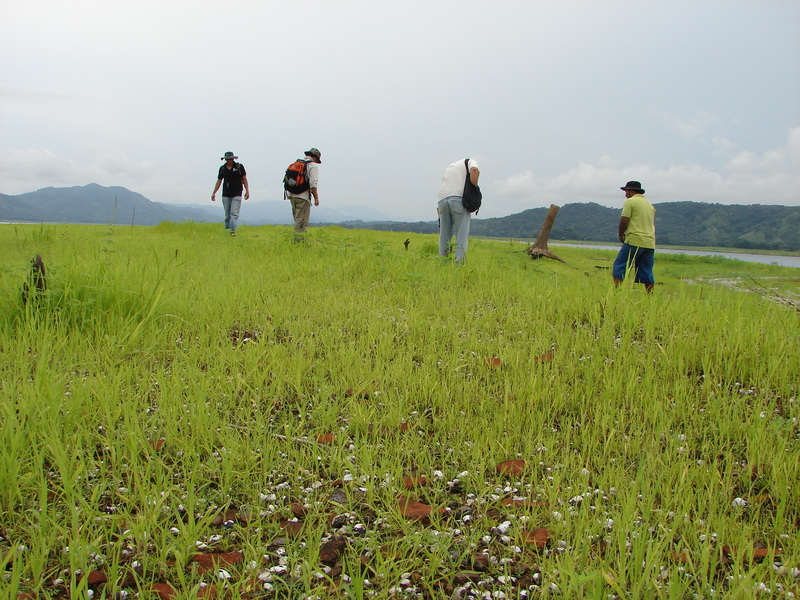 Detail of survey in Alhajuela Lake area. Gestern abend war der Camino Real auf Terra X Faszination Erde im zweiten deutschen Fernsehen zu sehen. Aus diesem aktuellen Anlass erscheint das erste Posting auf Deutsch auf dem Blog der das Forschungsprojekt zum Camino Real begleitet (sonst ist der Blog in Englisch gehalten). Hier eine Aufnahme vom Camino Real. (im ZDF-Beitrag waren die Stufen der ehemaligen Kirche von Venta de Cruces am Camino de Cruces zu sehen). Der Camino Real verbindet Panama City am Pazifik mit Portobelo auf der Karibikseite von Panama. Die Bedeutung des Weges stieg nach der Eroberung vom Inkareich im Jahr 1532/33, und es begann der Transport der erbeuteten Reichtümer auf dem Camino Real an die Karibikküste und von dort nach Europa. Gold und Silber wurde im königlichen Zollhaus in Portobelo gelagert und von dort mit der spanischen Schatzflotte nach Europa geschifft. Seine Hochzeit hatte der Camino Real und die Feria (Handelsmesse) von Portobelo zwischen 1550 und 1650, danach setzte durch den Schmuggel und die Piratenangriffe bedingt ein Niedergang ein. Die anfänglich jährlich kommende Schatzflotte traf danach nur mehr alle paar Jahre ein und die Handelsmesse wurde nach dem Krieg (von Jenkins Ohr) und Zerstörung von Portobelo von 1739 aufgelassen. Der Camino Real hatte seine weltweite Bedeutung verloren und nur mehr regionale Bedeutung. Nach einem weiteren wirtschaftlichen Abschwung und dem Bau der ersten Eisenbahnlinie von Colon nach Panana Stadt, geriet der Weg danach endgültig in Vergessenheit und wurde vom Regenwald überwuchert. Die Hufeisen der Maultierkarawanen haben ihre Spuren im weichen Gestein des Bachbettes hinterlassen. Der Weg liegt nun knapp 200 Jahre vergessen im Regenwald, nur in den letzten Jahrzehnten wurden Abschnitte die Nahe der Stadt Panama liegen, von der sich ausbreitenden Stadt und Landwirtschaft zerstört. Heute geht es darum die noch bestehenden Reste des Camino Real im Regenwald zu vermessen und vor der Zerstörung zu bewahren. Hier beginnt nun meine Beteiligung an der Geschichte: vor einigen Jahren “entdeckte” ich den Camino Real und seine faszinierende Geschichte, habe danach ein Forschungsprojekt initiiert, das ich nun seit zwei Jahren leite, mit dem Ziel den originalen Verlauf dieses historischen Weges zu vermessen, seinen Erhalt und den Schutz der umliegenen Nationalparks, durch nachhaltige Entwicklung der ländlichen Region und Kulturtourismus für die Zukunft zu sichern. 1. Identifizierung des originalen Verlaufs des Weges (diese Arbeit ist fast abgeschlossen). 3. Realisierung eines Pilotprojektes in einer ländlichen Gemeinde entlang des Weges. See here (http://geotourism.changemakers.com/en-us/node/24556) for more details on the competition proposal (in spanish), or read a comment IN ENGLISH with summary of the project here (http://geotourism.changemakers.com/en-us/node/24557). I invite you to register in “Changemakers” (http://www.changemakers.com/en-us/user/register) and make your own comments on the project, which will raise rating for the proposal and will help to realize it. 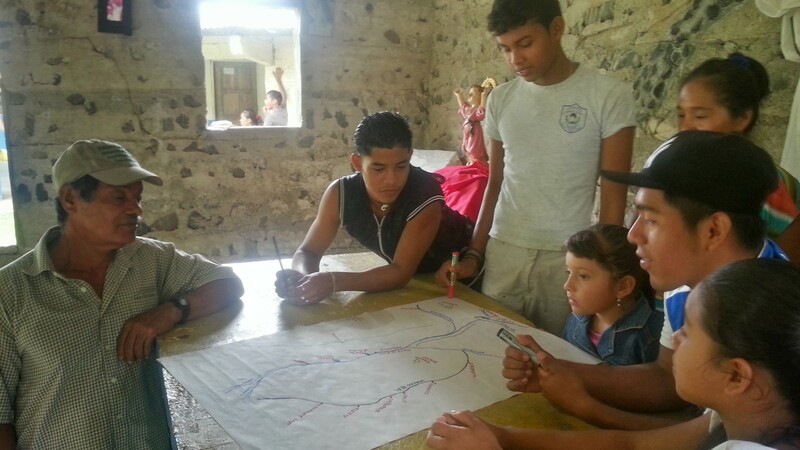 We are developing currently the blog about the research project on the Camino Real in Panama. The project goes since Abril 2008. 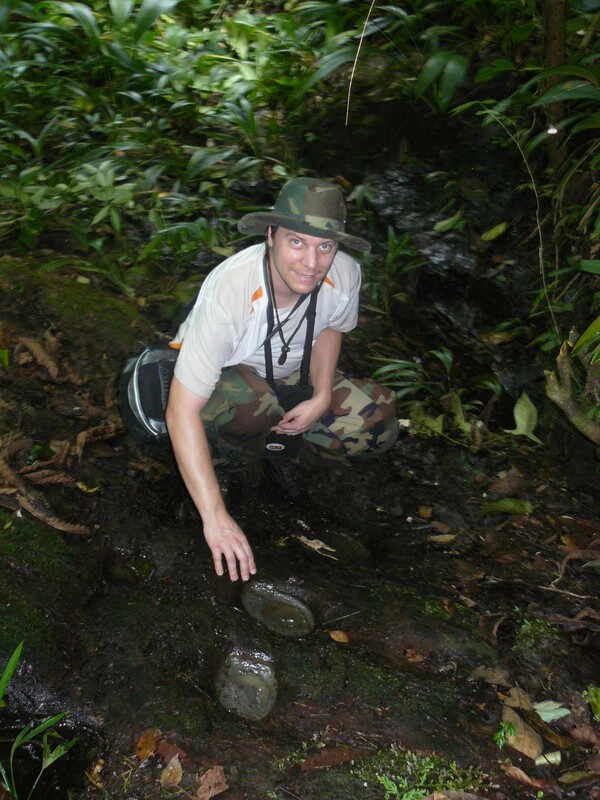 We will publish also blogs on field trips of past dates. We are still doing the basic set-up of the blog, therefore please excuse the raw contents of the blog. Start for our first exploration trip to the Lake Alajuela. Our group consisted of Carlos Gomez from INAC, Juan Martín from Panama Viejo, Jean-Christoph, Christian Strassnig PR, and Gilmo Chami our boatmen. Download a file with the course of this section of the Camino Real for Google Earth. Early in the morning at 5:00 A.M. we left Panama City and head to Puerto Corotú, close the mouth of the River Chagres into this artificial lake. At 8:30 A.M. we boat out with our boatmen Gilmo. 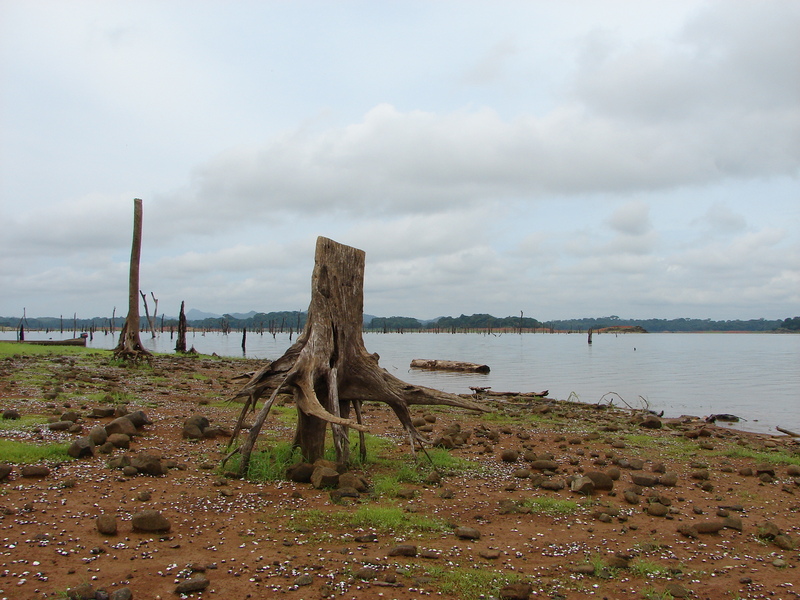 The Camino Real in the area of the Alajuela Lake was flooded in great parts, because of the creation of artificial lake, that serves as additional water reserve for the functioning of the Panama Canal. 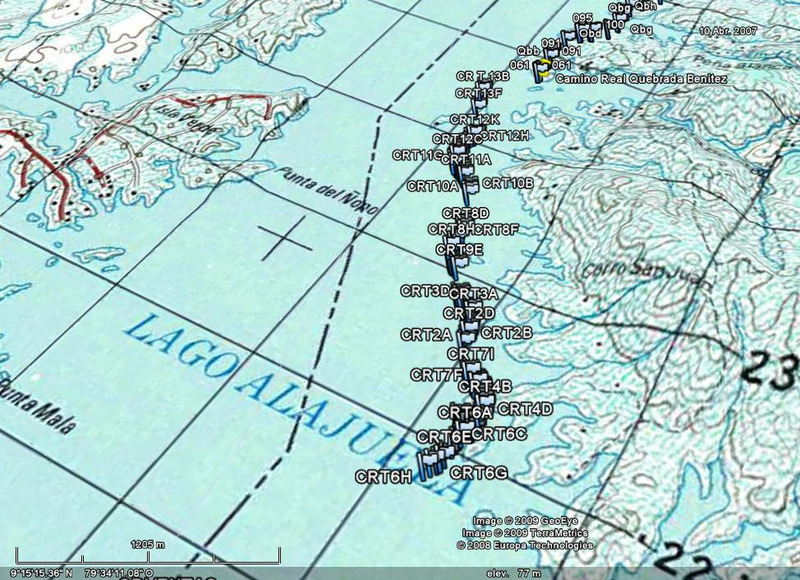 The waypoints show the Camino Real running parallel the actual shore of the Alajuela Lake. 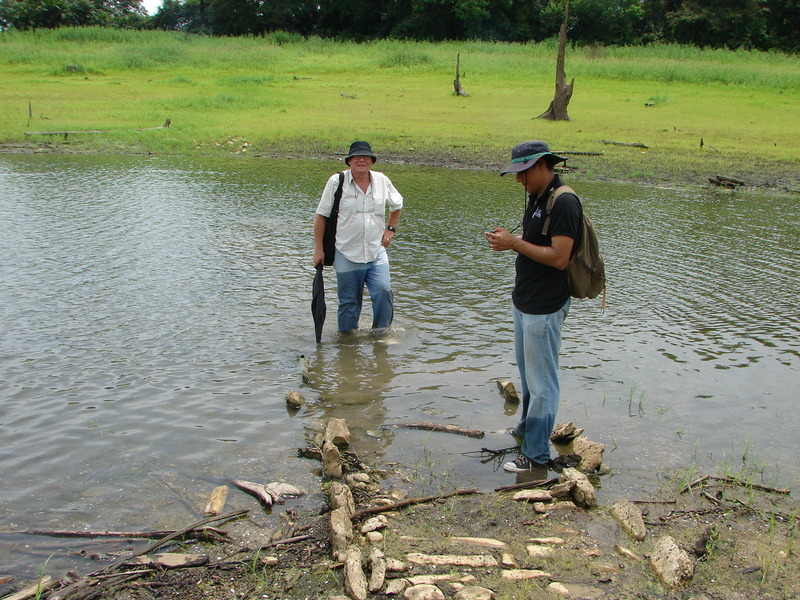 We visit first a section of the Camino Real that is submerged most of the year, southeast of the “Venta the Chagres” site. 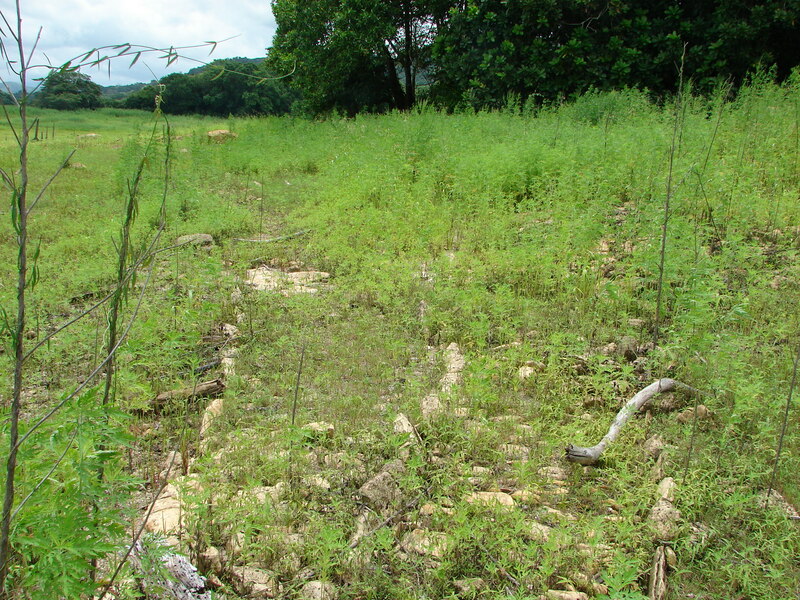 Submerged section of Camino Real southeast of "Venta de Chagres". 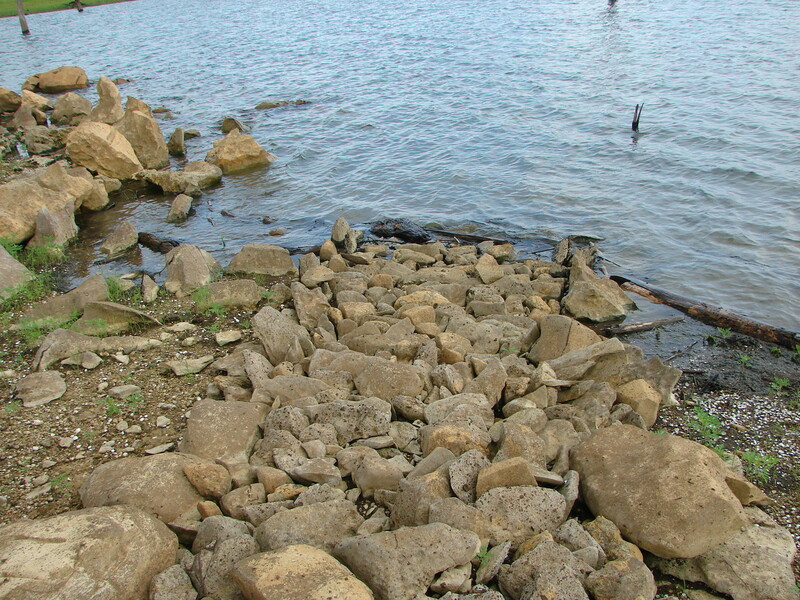 The cobbles of the trail have been removed from the earth because of changing water level of the lake. 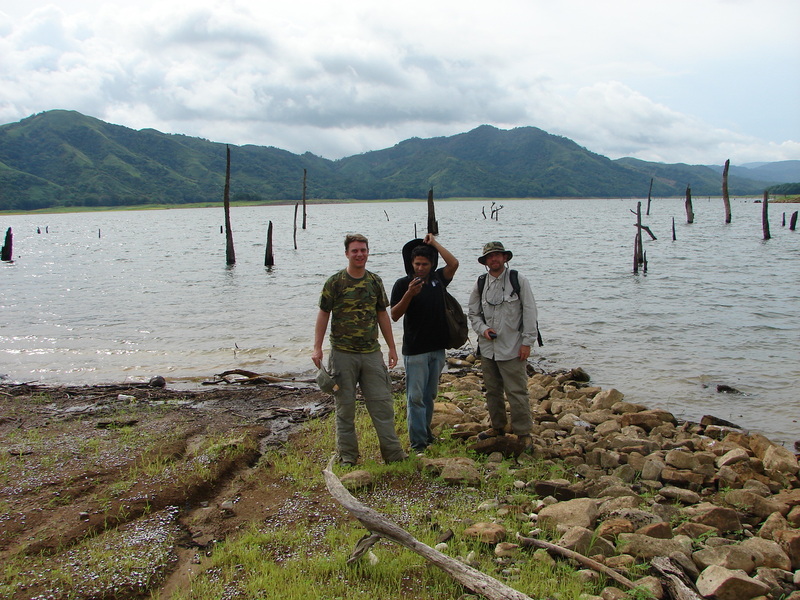 Then we continued to a platform, site of the “Venta de Chagres”, which normally lies under water, but emerged because of the low level of the Alajuela Lake at the end of the dry season. Site of "Venta de Chagres" a former road station. The site of the Venta is completely below the normal water level. 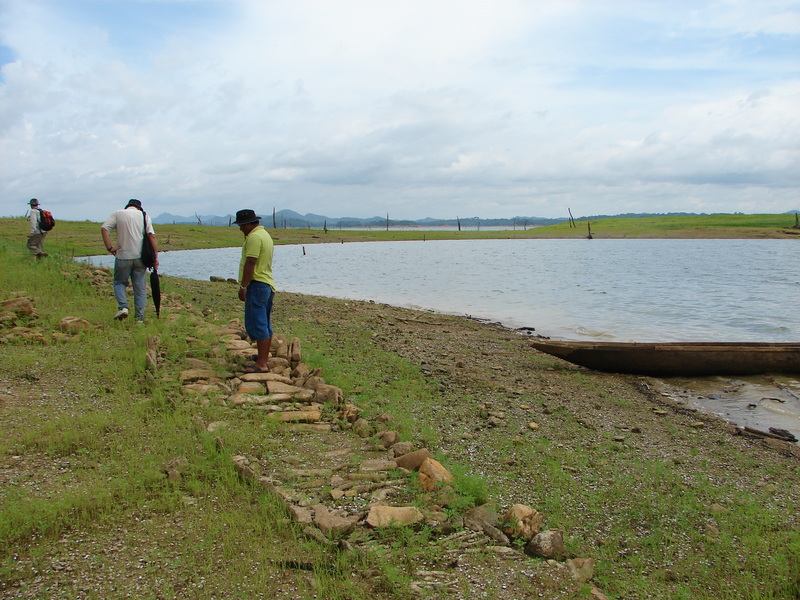 The stratification of this site has been affected severely by the changing water level of the lake which has washed away almost 80 centimeters of soil. 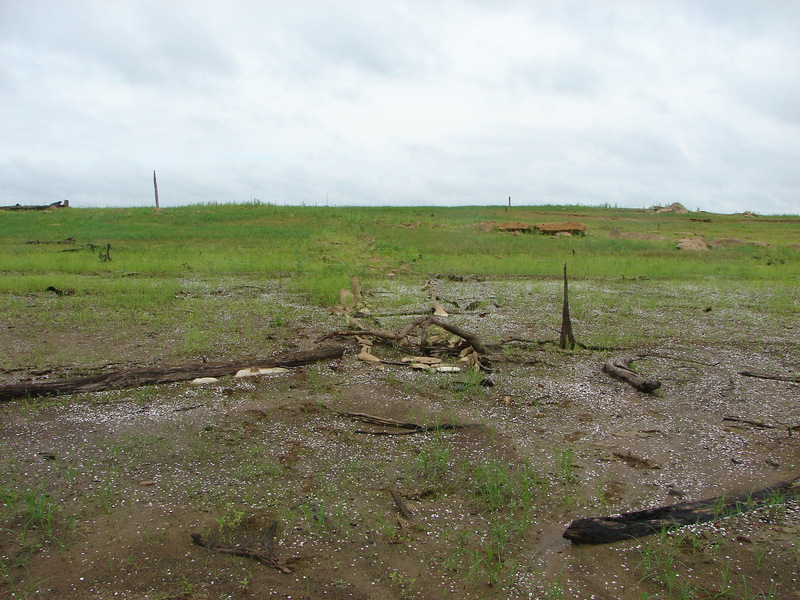 The roots of this sunken tree indicates the former soil level, this erosion occurred since 1935 when the lake was created. 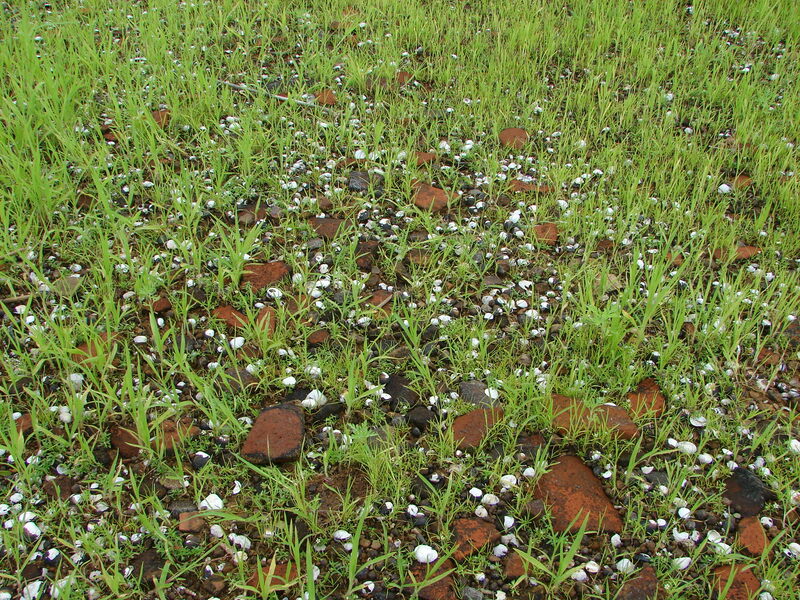 A pre-colombian stone artifact is mixed among colonial roof tiles. A number of roof tiles. 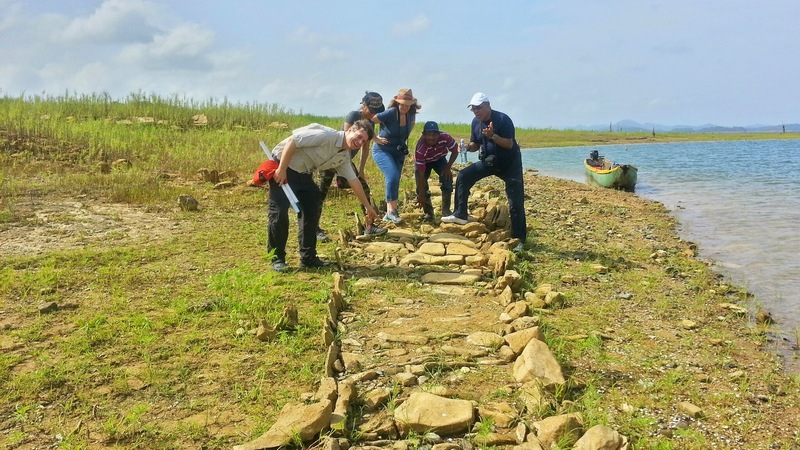 From the Site of Venta de Chagres, we had to cross about 1.5 kilometres of the waters of Alhajuela Lake, before the next sections of the Camino Real emerged. The Camino Real runs in this area almost parallel the eastern shore of Alhajuela Lake, submerging and emerging several times in its waters. We found some interesting points in this area: an intersection of the main Camino Real, a small cobblestoned trail that diverts with 90 degrees from the main trail. 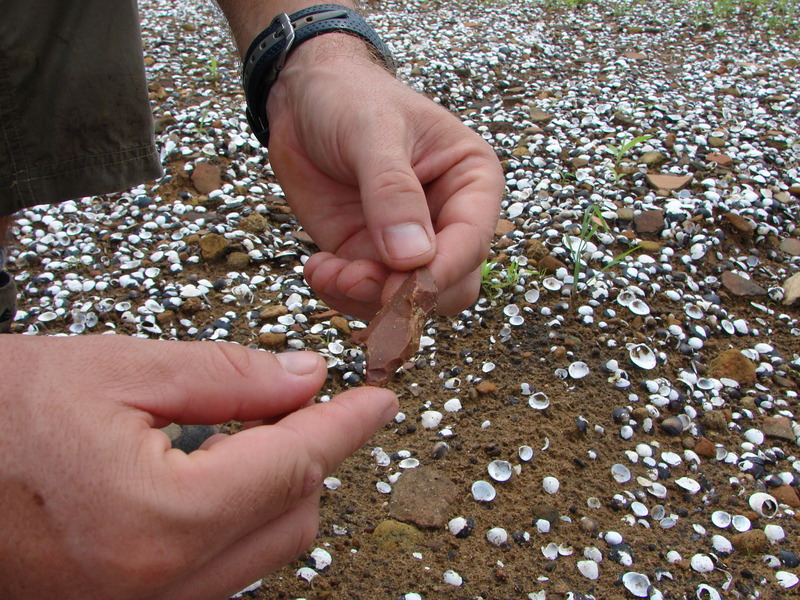 In some area the cobblestones lie loose on the ground, result of the waves of the lake that erodes the soil. Other sections, probably better protected from the waves, remain almost intact, with a very even surface of the trail. The Camino Real emerges and submerges several times in the artifical Alhajuela lake, following its eastern shore. The intersection of the main Camino Real is well preserved, the surface almost flat. We have not figured out in detail were the second trail goes. Probable only a small deviation of small section. The Camino Real divides here into two trails of same width and design. Here another view of the Intersection of the Camino Real. Some 60 metres ahead we found another intersection, this time a secondary way branched off the main trail. A secondary way branched off from the main Camino Real. 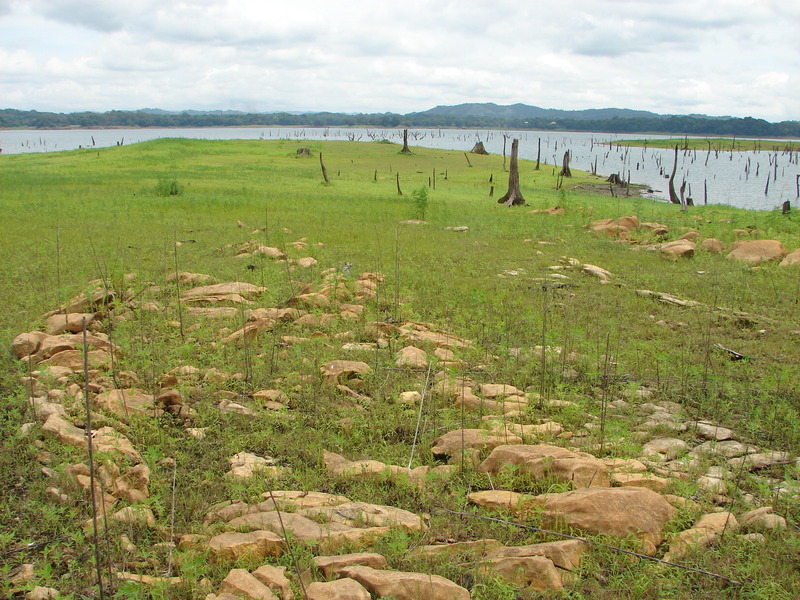 The landscape at the lake is dominated by many natural rock formations and sunken trees that not have been cut before the creation of the artificial lake. 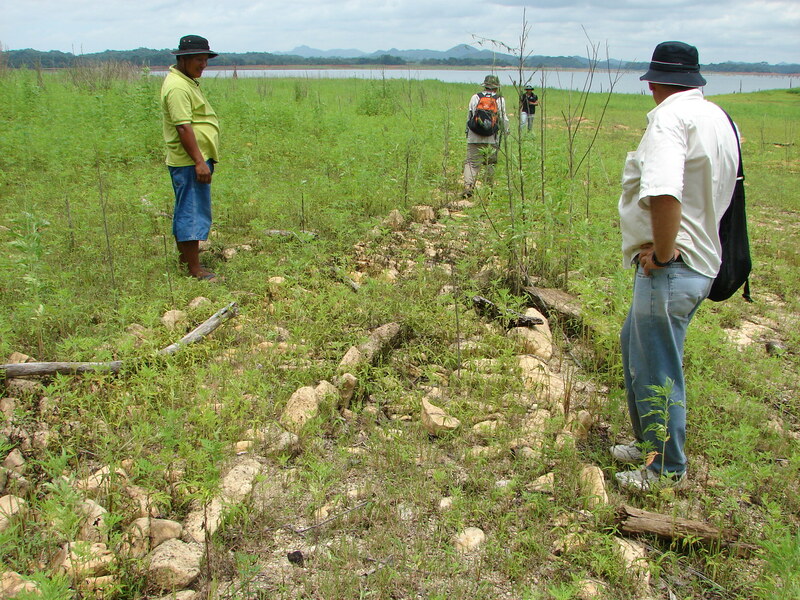 The following picture illustrates very well the impact of the waves of the Alhajuela lake on the state of conservation of the Camino Real. 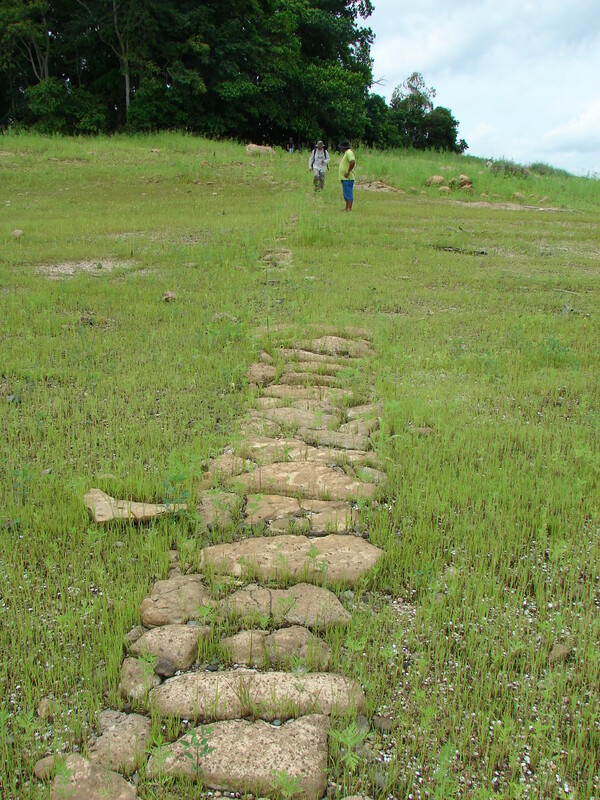 The cobblestones at the back of the trails are still in position and maintain an even surface, whereas the stones in the foreground have been eroded from the soil already. 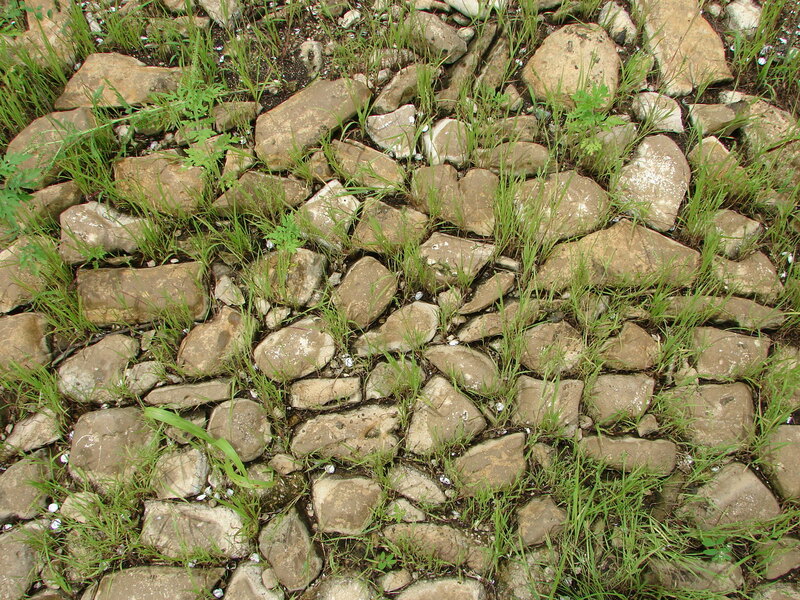 The picture demonstrate well the effect of erosion caused by the waves of the artifical lake on the cobblestones of the Camino Real. This is good example of an intact surface of the Camino Real. 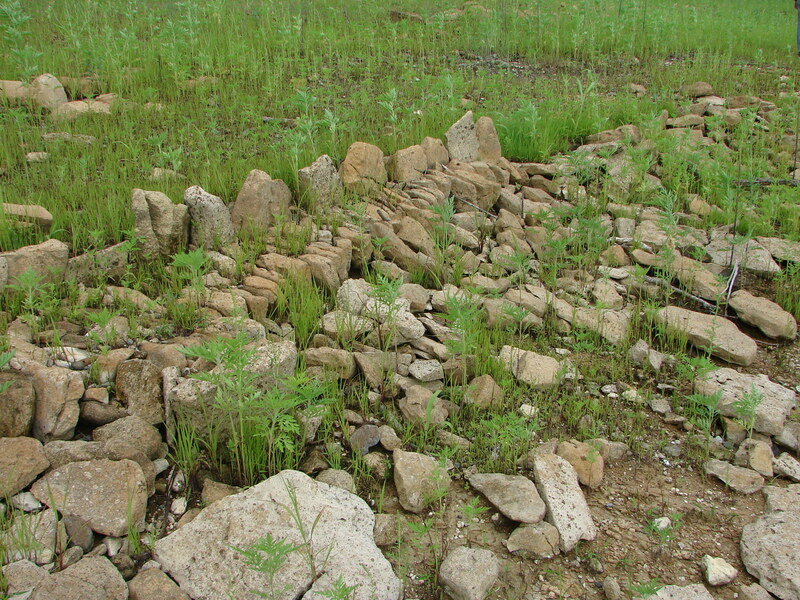 When the erosion washes out all the soil between the stones they end as loose stones on the ground. At the end of the day the Camino Real disappeard in the waters of the Alhajuela Lake, directing into deeper waters of the lake and rocky land tip opposite to our place. That is where we will continue to explore on the next day.